XTAR has one customer and one customer only: the military or government user. We see this as a strength, not a limitation, as everything we do is designed to ensure success for that end user. With a lot of talk recently about HTS, we wanted to explain how we compare, especially from the user’s experience. This four-part series will examine the key ways in which HTS and X-band differ according to the needs and requirements of that military/government user. At the top of any military/government user’s list of requirements is reliability. Simply put, communications are always critical whether our user is in the desert or at sea. A close second to that list is flexibility as many of today’s missions do not stay in one place. Communications must be reliable in one spot and have the flexibility to quickly and seamlessly move to another. When comparing the two, the first obvious difference between X-band and HTS is the size of the beam. 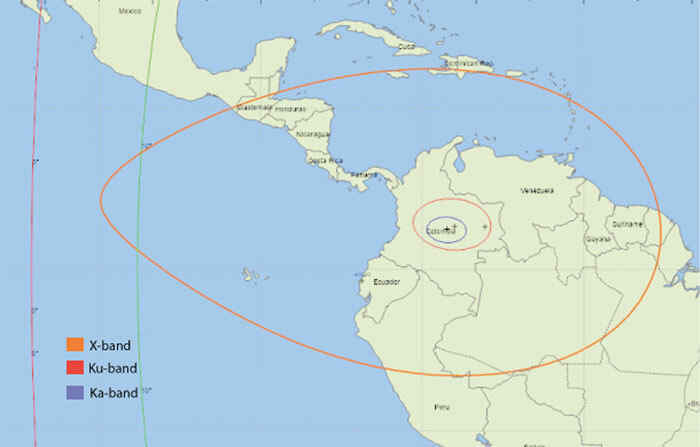 While HTS beams may only be a few hundred miles wide, X-band beams are a few thousand miles wide. A comparison of band sizes for X-, Ku- and Ka- bands is shown in the map below. The difference in beam size is most notable during country-wide maneuvers or those that take place across a wide geographic area. To cover the globe, HTS beams are placed side by side, so while most areas in the world are covered, they are covered by multiple, small beams. Therefore, a military user moving across HTS beams would have to install specialized and costly equipment in order to transition between beams and maintain communications as they move. Without this equipment, the user would experience a loss of signal as they switch beams. Utilizing one of XTAR’s wide X-band beams requires no switching, no related loss of signal and uses equipment they already have. In certain locations, some of these small HTS spot beams are in high demand by both commercial and government users and experience congestion – so access may not be guaranteed. But as X-band from XTAR is reserved solely for the military/government, there are fewer users overall and link availability is rated at 99.9%. Finally, any discussion of reliability and flexibility must include the potential impacts of weather. Due to its frequency range, X-band will hold signal in rain, sand storms and other challenging conditions. Neither HTS Ku- nor Ka-bands have all weather-reliability. So while X-band has the reliability and flexibility needed for the military/government user without specialized equipment and additional procedures, how does it perform? Everything you’ve heard and read probably highlights the efficiencies of HTS. Check back with us next week when we address that issue head on.